A section of Asante Kotoko supporters are on the streets of Kumasi to mobilise support ahead of their Wednesday’s CAF Confederation Cup Group C encounter against ZESCO United on Wednesday. The Porcupine Warriors are creating awareness for their second Group C against Zesco United at the Baba Yara Stadium. 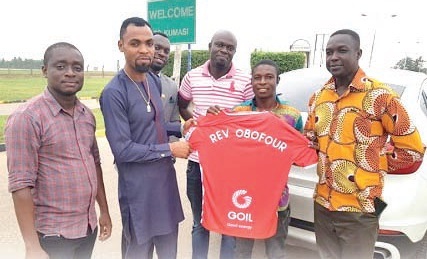 He was presented with a customized jersey from their kit suppliers, ‘Strike’ and asked the Kumasi-based pastor to rally his support behind the team in their Africa campaign. Edwin Okyere Boateng, Evans Owusu and Frank Appiah (Sports Journalist) are the leaders of the Awareness Group. Kotoko will be hoping to bounce back after suffering 1-0 defeat to Al Hilal in their opening game in Sudan.